If you’re inspired to straighten your teeth because your kids are wearing braces, then you’re not the first parent to feel that way. Lots of moms and dads realize that they want to have a perfectly straight smile about the same time that the kids are getting one, too. The difference is that as an adult you may not be interested in wearing metal brackets and wires. No problem. Dr. Wakily is a certified provider of Invisalign in Islip, so you can have your teeth straightened, too, and hardly anyone will know that you’re wearing braces. Invisalign is an advanced orthodontic system that moves teeth into proper alignment through the use of clear plastic braces. Called aligners, these braces are made of BPA-free plastic that is smooth, so it won’t cause abrasions or lacerations in your mouth the way metal brackets and wires can. Therefore, getting used to your braces will hardly take any time at all. Is Invisalign appropriate for my smile? Invisalign was created to address any number of orthodontic concerns. Of course, Dr. Wakily will be able to determine if Invisalign is right for you, but most patients are qualified candidates. These clear braces work for an overbite, underbite, cross bite, rotated (crooked) teeth, an overjet (bucked teeth), a misplaced midline and crowding problems. Your first step on the road to a straight smile is a consultation and checkup at East Islip Dental Care. We’ll take x-rays, photographs and impressions of your teeth and mouth that Dr. Wakily and the Invisalign lab will use to develop your orthodontic treatment plan. This plan will direct the manufacture of each set of Invisalign aligners that you’ll wear to correct your alignment. What’s the advantage of Invisalign over traditional braces? 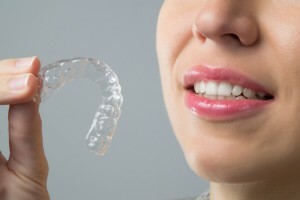 Aside from the obvious—which is that Invisalign clear braces are not obvious—they are also removable. This means that you will be able to maintain your regular diet. At mealtime or for a snack, just remove the aligners and eat whatever you like. You’ll also be able to brush and floss as you normally do, as well. This is particularly helpful, because people who wear traditional braces often have a hard time adequately cleaning their teeth. Don’t envy your children because they’re on the way to having straight and beautiful smiles. Get even! Have your teeth straightened with Invisalign in East Islip and you can have the same straight smile with braces that are comfortable and discreet.